THE UNEMPLOYED EATER: Schulzie's "Bread Pudding Parlor" on Lincoln to Open In "Next Several Months"
Schulzie's "Bread Pudding Parlor" on Lincoln to Open In "Next Several Months"
At Sunday's THE TASTE Flavors of L.A. event I had the distinguished pleasure of meeting Sarah Schulz, the mastermind behind Schulzie's, purveyors of 108 different flavors and some of the city's best bread pudding. Sarah is exactly what you want the owner of a bread pudding-only shop to be like: energetic, bubbly and above all, freaking excited about spreading the bread pudding gospel. As a fellow bread pudding admirer myself, I decided to ask her about the long-gestating second location of Schulzie's on Lincoln Blvd. in Venice, adjacent to Wurstkuche. With signage up for a while, it did not appear any progress had been made. I was wrong - as the renderings above and below attest. Sarah informs me the new "bread pudding parlor" will open "hopefully in the next several months," and will serve 20 warm and chilled puddings daily (compared to just chilled at the original location on the nearby Venice Strand). 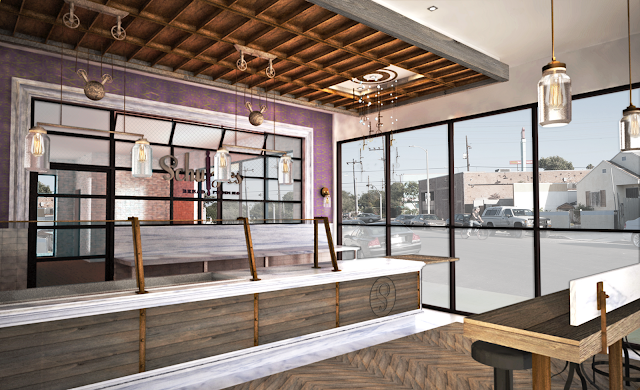 It will also feature an old school soda fountain slinging homemade sodas and full coffee service using the highly-lauded Blue Bottle Coffee. 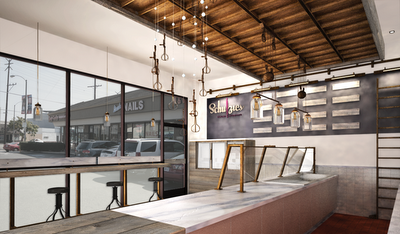 Also of note: a San Francisco (Hayes Valley) Schulzie's starts construction in the next few weeks and will be very similar to and open around the same time as the Lincoln Blvd. location. Now, all this typing about bread pudding makes me want bread pudding, so someone get me some bread pudding! Saw her on Shark Tank. Mark Cuban is right; she needs a more business-minded partner to help her. Andrew - Agreed. And I don't think this location is happening either. She had signage up there forever - but now it looks like it's becoming a Locali. A month or two ago, I emailed to inquire and got no response. That said, her bread pudding is VERY good. I wish her the best of luck.